Description - The name cactus derived from the Greek word kaktos, which means prickly plant. Cacti come in unusual shapes, sizes, textures and flower colours. Most have abandoned leaves and unusual body shapes to prevent loss of water. Some are ribbed or segmented and they may be covered with decorative spines, bristles or hairs. Origin - South-western USA, Central and S. America, and Southern Canada. Varieties - There are two groups of cacti - the desert ones (usually covered in spines), and the jungle or rainforest cacti (often without spines and most are epiphytes). There are some 200 genera and several thousand species. They are generally small but others, such as the old man cactus, can grow to 3m tall. Cacti are flowering plants and their shapes can be spherical, pillar, cushion or candelabra. Care Tips - Desert cacti: from spring to autumn place them in the sunniest position. You can place them outdoors but protected from rain. From mid autumn, bright and cool. Water thoroughly from late spring to early autumn. From mid autumn keep dry. 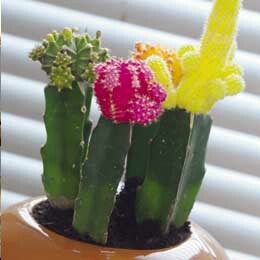 Give cacti fertiliser every fourteen days when new growth appears. Epiphytic cacti on the other hand, need more water, high humidity and they do not want sun. Do not mix or grow desert cacti with jungle ones, as the two groups need entirely different conditions. Trivia - Desert cacti have spines as these maximise the surface area of the plant. Often their only source of moisture is wet mists passing through the desert in winter and they collect water from the mists, which condenses on their spines.